These Terms and Conditions of Sale are a legal agreement (the “Agreement”) between you (“Buyer” or “you”) and Embr Labs, Inc., a Delaware corporation, with its principal place of business at 288 Norfolk St., Suite 4A, Cambridge MA 02139 (“Embr,” “we,” “us,” or “our”), establishing terms and conditions under which Buyer shall purchase Embr products (“Products”). The earlier of the date Buyer first agrees to or accepts this Agreement, or that Buyer otherwise first orders any Products is referred to herein as the “Effective Date.” If Buyer’s order of Products is deemed an offer, Embr’s acceptance is expressly conditional on Buyer’s acceptance of the terms of this Agreement; if the terms of this Agreement are deemed an offer by Embr, Buyer’s acceptance is expressly limited to the terms of this Agreement. Any additional terms or conditions (preprinted or otherwise) proposed by Buyer shall not become a part of this Agreement. Terms or conditions contained in Buyer’s purchase order or other form containing terms and conditions shall have no force or effect. This Agreement may be established through signature of both parties, through an on-line click through process via our website at www.embrlabs.com (“Website”) or this Agreement may be established through Buyer’s agreement to Embr’s quote or proposal referencing these Terms and Conditions of Sale. before you click on the “i accept” button, before you agree to purchase products, or before you otherwise indicate acceptance of this agreement, carefully read the terms and conditions of this agreement. by clicking on the “i accept” button or by ordering the products, you agree to be bound by and are becoming a party to this agreement as the “buyer.” if you do not agree to all of the terms of this agreement, then do not click “i accept” and do not order or purchase the products. these terms contain an agreement to arbitrate, which (i) requires that you and embr labs, inc. arbitrate certain claims by binding, individual arbitration instead of going to court and (ii) limits class action claims, unless you opt out of the agreement to arbitrate as described in the arbitration section (see section 10). 1. General. These Embr Terms and Conditions, all Addenda hereto (if any) issued by Embr, the accompanying quotation or proposal issued by Embr or its authorized representative in printed, electronic, on-line (on the Website or otherwise) or other form (a “Quote”, and collectively, the “Agreement”) shall exclusively govern Embr’s sale of Products to you. When placing an order for the Products, you will be required to provide certain information, such as your address and billing information. You covenant that all such information is true and correct. All orders are subject to acceptance by Embr. In the event of any conflict between a Quote and these Terms and Conditions, these Terms and Conditions shall control. 2. Price. Unless expressly stated otherwise in a Quote, the price(s) for the Products will be those listed in the accompanying Quote and expire thirty (30) days from the date thereof, unless sooner changed by Embr on the Quote. Additional fees, terms and conditions may apply to access to the Embr’s services associated with the Products. Unless expressly stated otherwise in a Quote, prices exclude all insurance, freight, federal, state and local taxes, GST, fees, customs, duties, levies and other governmental assessments, all of which shall be paid by Buyer directly or, if paid by Embr, shall be paid by Buyer to Embr within 30 days of invoice of the same delivered by Embr to Buyer. Buyer will be charged in full or invoiced at the time of order of each Product, as Embr may determine on a case-by-case basis. Except as otherwise agreed in writing by Embr, Buyer shall pay invoices in full within thirty (30) days of the date of invoice. All amounts not paid when due will accrue interest at the rate of 1.5% per month, or the maximum amount allowed by law, whichever is lower. If Buyer’s account is referred to an attorney or collection agency for collection, Buyer shall pay Embr’s expenses incurred in such collection effort including, without limitation, reasonable legal fees and expenses. 3. Shipment. All sales shall be F.C.A. (Incoterms 2010) shipping point. Title (except for software, for which Embr shall retain title) and risk of loss shall pass to Buyer upon the earlier of delivery of the Products to the Buyer or a carrier for shipment to the Buyer. Embr will use reasonable efforts to meet requested shipping dates, but will not be liable for any failure to do so. All shipments will be made at Buyer’s risk. (a) Limited Warranty. The limited warranty set forth herein applies only to the Buyer, may be acted upon only by the Buyer, and may not be assigned, sold or transferred to any third party. Embr warrants only to the Buyer that, for a period of one (1) year from delivery, the Product shall substantially conform to Embr’s published specifications as of the date of shipment. The limited warranty herein shall not apply to (i) any Product that has been customized, altered or repaired by any person or entity other than personnel of Embr or personnel specifically authorized by Embr, (ii) any Product that has been subjected to abuse, misuse, damage, neglect, or accident beyond Embr’s published limitations for the Product or other causes external to the Products (including, without limitation, environmental conditions and power conditions), (iii) use of the Product in combination with products or software not supplied by Embr, (iv) any use or operation of the Product other than in accordance with Embr’s then-current published specifications and instructions for the Product, or (v) any non-conformities or defects notified by Buyer to Seller with respect to a Product after the expiration of the applicable warranty period for such Product. (b) Remedies. Buyer’s sole and exclusive remedy and Seller’s sole and exclusive liability for a breach of this limited warranty shall be, at Seller’s option, Seller’s use of its commercially reasonable efforts to repair or replace the non-conforming Product. If Embr is unable, after reasonable efforts, to repair or replace such substantially non-conforming Products, Embr, may, at its sole discretion, elect to refund of an amount not to exceed the actual payments received by Embr for such Product(s). 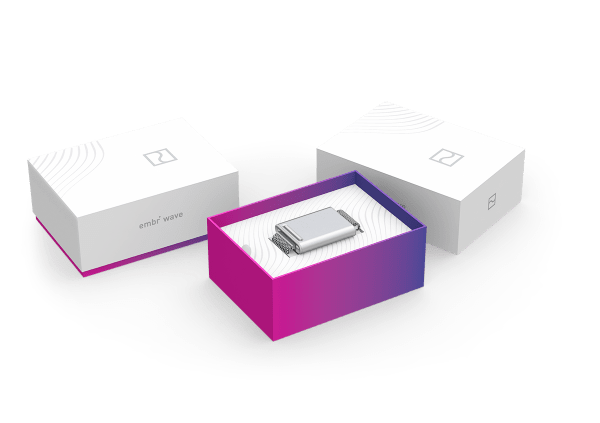 Buyer shall not return any Product to Embr without an Embr-issued RMA number; Buyer shall contact Embr at hello@embrlabs.com to request a return and to obtain directions for returns of Products. Shipping costs and the risk of loss for a returned defective Product with a proper RMA number shall be borne by Embr, and Embr shall assume the risk of loss while the Product is in the Embr facility. Products that are repaired or replaced by Embr shall be covered by this limited warranty for the remaining warranty period for such original Product. (a) to the extent permitted by applicable law, in no event shall embr (or its suppliers or licensors) be liable to buyer or any third party for special, incidental, consequential, exemplary, punitive, multiple or other indirect damages, or for loss of profits, loss of data or loss of use damages, arising out of the products, manufacture, sale, supplying or failure or delay in supplying of the products, services related thereto or the use, results or disposition of the products, whether based upon warranty, contract, tort, strict liability or otherwise, even if seller has been advised of the possibility of such damages or losses. (b) to the extent permitted by applicable law, embr (and its suppliers’ and licensors’) liability arising out of products, the manufacture, sale, supplying or failure or delay in supplying of the products, services related thereto or the use, results or disposition of the products, whether based upon warranty, contract, tort, strict liability or otherwise, shall not exceed the applicable purchase price paid by buyer for the applicable product in the then-prior twelve (12) months. (c) Use of Products at Buyer’s Risk. buyer assumes sole and exclusive responsibility and liability for any claims or damages of buyer or any third party arising from use of the products. to the extent permitted by applicable law, buyer shall be solely responsible for, and embr shall have no responsibility for, personal injury or property damage resulting from or alleged to result from the products. 6. Intellectual Property; Software. No sale of any Product, and nothing in this Agreement, shall be construed as granting to Buyer any license or other proprietary or intellectual property right applicable to the Products. Buyer may not alter or remove, and shall abide by, any patent, trademark, copyright, trade secret, proprietary or other notices contained on or in the Products. With respect to any software installed in the Products (the “Software”), Embr and Buyer intend and agree that such software is being licensed and not sold, and that the words “purchase”, “sold” or similar or derivative words are understood and agreed to mean “license” and that the word “Buyer” or similar or derivative words is understood and agreed to mean “Licensee”. Embr (and its licensors) retain exclusive ownership of and title to all Software, notwithstanding anything to the contrary stated herein. Subject to the terms and conditions of this Agreement, Embr grant to Buyer a royalty-free, non-exclusive, non-transferable license, without right to sublicense, to use Software in object code only as installed by Embr in the Product delivered hereunder and solely for Buyer’s own internal business purposes in accordance with user documentation provided by Embr. The foregoing license is transferable only upon the resale of the Product in accordance with Section 7. Buyer shall not (a) modify, copy, enhance, make derivative works of the Software or (b) disassemble, decompile, reverse engineer or otherwise derive human readable code from the Software. Unless expressly allowed by applicable law, Buyer agrees to hold in confidence the Software and related documentation supplied hereunder and not to disclose or make available in any form the same, except to our and Buyer’s employees and agents. If applicable law requires or expressly permits access to such source code for the purpose of achieving interoperability with other software, and the Buyer desires access for that required purpose, Buyer shall notify Embr in writing, detailing the basis for such access. On receipt of Buyer’s notice, Embr shall have the option, in its discretion, to (i) perform the work to derive any required information or (ii) allow Buyer or its access to the relevant section of the source code of the Software solely for the legally required purpose. Embr shall have the right to terminate this license upon written notice to Buyer if Buyer fails to comply with any term or condition herein. 7. Use; Resale. All Products are solely for personal, and not commercial, use. Subject to the terms and conditions of this Agreement (including, without limitation, Sections 8 and 9), Buyer shall have the right to resell or transfer the Product to any third party (an “End User”), provided that (a) Buyer makes such sale pursuant to binding terms and conditions no less protective of Embr and the Product than this Agreement, (b) Buyer makes no representation or warranty on behalf of Embr, (c) Buyer fairly and accurately represents the Product at all times only in accordance with the express statements in Embr’s written documentation, and (d) Buyer ensures that this Agreement and Embr’s user manual and all applicable warnings are delivered to each and every End User of the Product. 8. Force Majeure and Allocation. If either party’s performance under the Agreement (except payment of monies due) is prevented, restricted, or interfered with by reason of casualty, accident, fire, strikes or labor disputes, terrorist acts, inability to procure materials or components, power or supplies, war or other violence, compliance with any law, order, proclamation, regulation, ordinance, demand or requirement of any government agency or intergovernmental body (including, without limitation, those related to infringement), production delays, or any other act, circumstance, or condition whatsoever beyond such party’s or its suppliers’ or licensors’ reasonable control, the party whose performance is prevented, restricted, or interfered with, upon notice to the other party, shall be excused from such performance to the extent of such prevention, restriction, or interference. Embr may allocate its available supply of Products among any or all of its customers on such basis as it may deem fair and practical, without liability for any failure to comply with the provisions of the Agreement with respect to delay in supplying such Products. 9. Governing Law; Dispute Resolution. This Agreement, and any dispute between you and us, shall be governed by the laws of the Commonwealth of Massachusetts without regard to principles of conflicts of law that would result in the application of the law of any other jurisdiction, except that the Federal Arbitration Act shall govern the interpretation and enforcement of the arbitration provisions set forth below. Unless you and we agree otherwise, in the event that Section 10 is found not to apply to you or to a particular claim or dispute, either as a result of your decision to opt out of the Agreement to Arbitrate (as defined below) or as a result of a decision by the arbitrator or a court order, you agree that any claim or dispute that has arisen or may arise between you and us must be resolved exclusively by a state court located in Norfolk or Middlesex County, Massachusetts or a federal court located in Boston, Massachusetts, except that you or we are permitted (i) to bring small claims actions in state court in the county in which you reside if such court has a small claims procedure; (ii) to bring claims for injunctive relief in any court having jurisdiction over the parties; or (iii) to seek enforcement of a judgment in any court having jurisdiction over the parties. To the extent permitted by law, you and we agree to waive trial by jury in any court proceeding. Embr Labs, Inc., ATTN: Arbitration Opt-out, 288 Norfolk St Suite 4A, Cambridge MA 02139, USA. This agreement to arbitrate will survive the termination of your relationship with us. 11. Miscellaneous. This Agreement constitutes the entire agreement between Buyer and Embr with respect to the subject matter hereof and is the final, complete, and exclusive statement of the terms of the Agreement, superseding all prior written and oral agreements, understandings and undertakings with respect to the subject matter hereof. Modifications may be made only in writing, signed by an authorized corporate officer of Embr. The waiver of any term or condition or any breach thereof shall not affect any other term of condition of this Agreement. Buyer shall not assign this Agreement without Embr’s prior written consent. Termination of this Agreement will not relieve Buyer of any of its obligations hereunder. If any provision of this Agreement shall be held illegal, unenforceable, or in conflict with any law of any authority having jurisdiction over this Agreement, the validity of the remaining portions or provisions hereof shall remain in full force and affect, and any unenforceable provision shall be replaced by a legally effective provision that comes as close as possible to the purpose of the unenforceable provision. This Agreement shall bind and inure to the benefit of the parties to this Agreement and their respective successors, permitted transferees, and permitted assigns. Embr and Buyer are independent contractors and are not partners, joint venturers, agents, employees or representatives of the other party. Embr shall not be liable for failure to perform any of its obligations hereunder by reason that are beyond its reasonable control, including, without limitation, fire, flood, earthquake, interruptions in supply, other natural disaster, war embargo, riot or acts of terrorism. The failure of EMBR to exercise or enforce any right or provision of this Agreement shall not constitute a waiver of such right or provision.